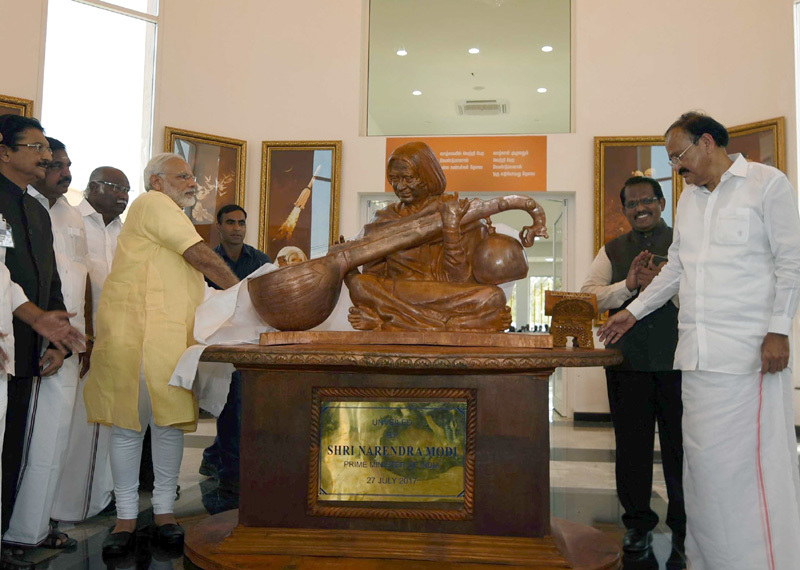 The Prime Minister, Shri Narendra Modi unveiling the statue of Dr. A.P.J. Abdul Kalam, at Pei Karumbu, Rameswaram, in Tamil Nadu on July 27, 2017. The Governor of Tamil Nadu, Shri C. Vidyasagar Rao and the Chief Minister of Tamil Nadu, Shri Edappadi K. Palaniswami and other dignitaries are also seen. Rameswaram: The Prime Minister, Shri Narendra Modi, today inaugurated the Dr. APJ Abdul Kalam memorial at Rameswaram. He unveiled a statue of Dr. Kalam, and offered floral tributes at Kalam Sthal. The Prime Minister also briefly interacted with the family members of Dr. Kalam. He flagged off a new Express train from Rameswaram to Ayodhya – named Shraddha Setu – via video conference. He released the synopsis of the Green Rameswaram Project; and unveiled a plaque to mark the dedication to the nation of a 9.5 km Link Road on NH-87, between Mukundarayar Chathiram, and Arichalmunai. The Prime Minister said a transformation in the ports and logistics sectors can contribute immensely to India’s growth. He mentioned that there is a healthy competition among States as far as the Swachh Bharat Mission is concerned. The Prime Minister said Dr. Kalam inspired the youth of India. He said that today’s youth wants to scale heights of progress, and become job creators.